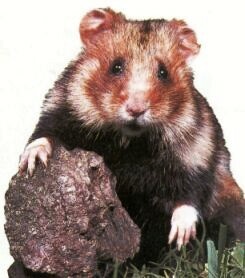 The Small Mammal Pets Honor is a core component of the Naturalist Master Award . If you realistically believe you can make a multi-year commitment to a small mammal pet, then you should go for it. Having a pet is not only an enjoyable experience, it may help you grow as a person. 3. Complete one of the following: a. If you currently have a small mammal pet, keep a record of the care for your small mammal for one month. Include in your record when it is watered, fed, and when its cage is cleaned. b. If you do not currently have a small mammal pet, but you have kept one for at least six months, “babysit” someone else’s small mammal pet for at least one week. Record the care that was required. Rats do best in wire cages because they enjoy climbing, and the wire offers good ventilation. A cage that is 2’ x 2’ x 2’ will generally do for a pair of rats, but a larger space would be much appreciated. If you plan to keep more than that, you’ll need a larger cage. The floor should be solid. A large, multi-level cage designed for ferrets can also make a great rat home, as can a large aquarium. If you opt for the latter, you’ll need a screen cover to provide ventilation, and will probably need to clean the cage more often to keep odor problems under control. a bedding of aspen or pelleted recycled paper must be provided. Do not use pine or cedar shavings, which can be harmful to your pets. If you find that your rats like to make nests, provide shredded paper towels or napkins for this purpose. High-quality rodent chow (called rat blocks) should be available to your pet at all times. You can find this at pet supply stores and feed stores— look for a brand with soymeal as the main ingredient. Offer small, bite-sized bits of fresh fruits and veggies daily. Rats LOVE people food, and you can give yours the occasional table scrap, such as cooked pasta or a bit of pizza crust. Limit treats or you’ll have a fat rat! A bored rat is an unhappy rat! Provide PVC tubes for your pets to run through, and ladders and tree branches for climbing. Parrot toys, including swings and ropes, are great for rats. Some rats love exercise wheels. Get one with a solid surface without wire rungs, so your pets’ tails cannot get caught while running. Also, give them appropriate chew toys to help wear down their teeth, which grow continuously. Chew toys are very necessary, considering they are rodents, and their teeth never stop growing. Most guinea pig chew toys are made out of wood, you can find them at multiple pet stores.